On nearly a perfect sailing day with 15-20 knots of winds from the southwest, we departed the Charleston Harbor for a day of off shore sailing. A first for me…Captain Wuus. Ocean sailing. Deep breath here. OK – I can do this. The “O-C-E-A-N” word that is. Pat did a phenomenal job in selecting a day with very minimal ocean swells, and steady southerly winds. (aka he knows it had better be ideal for me!) It was a most memorable sail. 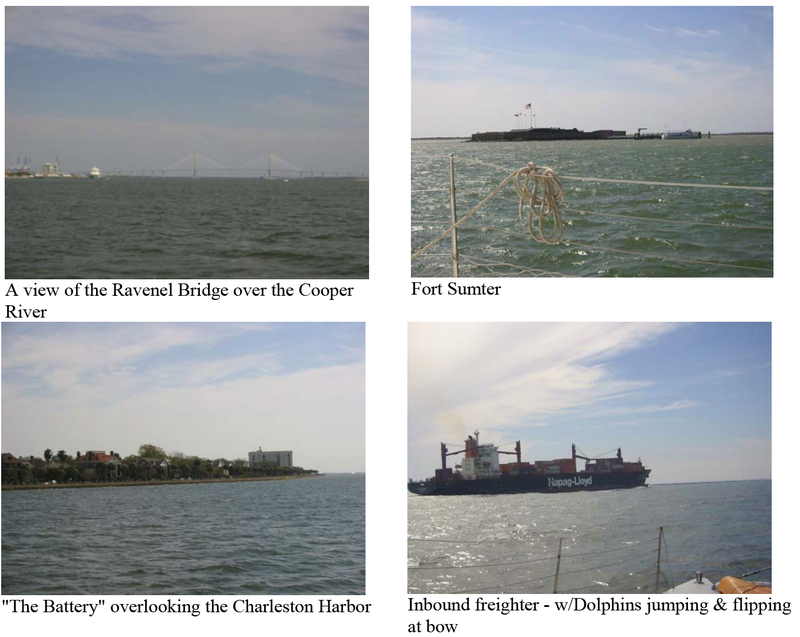 We sailed straight out of the Charleston Harbor past Fort Sumter…and then along the jetty’s in the shipping channel eastbound for approximately 12 miles. At mile 10 – I could no longer see land. While initially this was a tad unnerving – I discovered the really cool part is all of the dolphins who track with your boat. The dolphins seem to let you know that you can relax — you’ve got friends out there. · The sea-state (surf, wave action) tends to be most pronounced when you leave the harbor. Probably has something to do with shallow waters and currents. The further offshore, the seas became more relaxed / steady. · Trans-Atlantic shipping freighters travel A LOT faster than shipping vessels in the Chesapeake Bay. Maybe they have to put their brakes on in the bay? These vessels coming into the channel heading for Charleston are easily doing 20+ knots. They blew right by us – and we were cruising under sail at 11 knots. I was watching the water action at the bow of one of these shipping vessels, and noticed what appeared to be jumping fish. Looking closely — it was our dolphin friends — putting on a sea world act of jumping and flipping in front of this fast moving shipping vessel. Very entertaining! I tried to get this dolphin excitement on camera….but my camera has a delay…and I kept missing the action. Oh well. Pat selected a second day for us to go offshore — and the weather was similar to our first day offshore. The winds may have been a bit stronger – in the 20-25 knot range. Again winds from the southwest. This seems to produce minimal ocean swells. It was a great sail again. I saw a shark this time….maybe a shark in distress? Noticed a large object that seemed to float at an angle. As we approached – I could see it was a fin – but not straight up. The shark seemed to be floating near the surface (he was big – 15-20 feet!) at a bit of an angle. Not fond of sharks. I was ready to see my dolphin friends again. 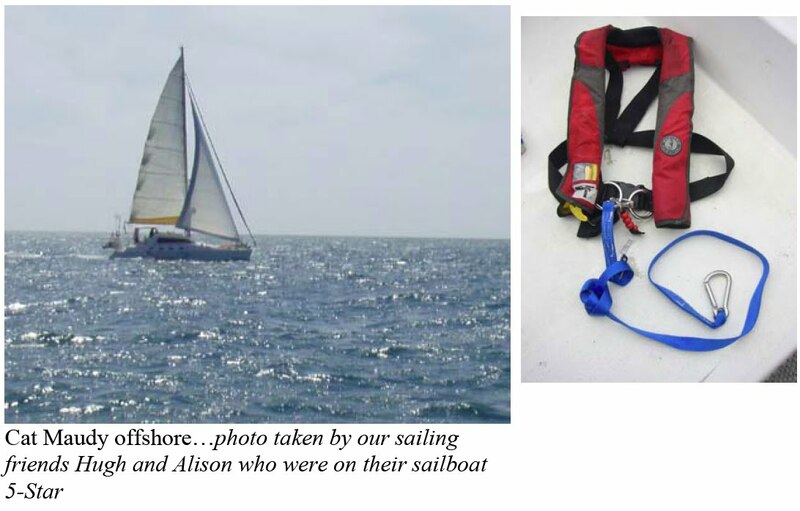 When sailing offshore – we have two added safety rules.1. mandatory to wear an offshore PFD (self inflates) at all times 2. always remain tethered to the boat. Each of our PFD’s has a 5′ tether line – allowing attachment on one end to the PFD…and the other end to any fixed object or jackline. Pat has setup a jackline (blue line that is connected around the perimeter of the boat) – so that if you have to go forward on deck — you are constantly attached to the boat.